Well, today’s the big day – my second blogiversary!! Remember to sign up for my cupcake giveaway by midnight tonight. For my last day of recap, I decided to highlight the top 10 big hitters from the last two years. Counting down from ten to one, these posts have drawn the most traffic to my blog. 9. Monkey Bread – posted July 23, 2009 – Monkey bread is a family favorite that I made recently. It’s perfect on a Sunday morning although we only make it when we have guests over because Hubby and I can’t eat the entire thing ourselves. 8. Stuffed Strawberries – posted July 31, 2008 – I love strawberries with chocolate. Most stuffed strawberry recipes out there use a cream cheese filling, but I stuffed mine with chocolate frosting. So pretty and tasty! 7. M&M Cookies – posted Oct 9, 2008 – I love M&Ms. They’re by far one of my favorite candies. Putting them in cookie form just makes them that much better. I really like the additional texture in these cookies from adding chopped nuts. 5. Alton Brown’s Overnight Cinnamon Rolls – posted Feb 5, 2009 – Cinnamon rolls are one of my favorite breakfast foods. This recipe from Alton Brown delivers an amazing cinnamon roll. 4. Crockpot Pulled Pork – posted March 24, 2009 – A lot of people find my blog by searching for crockpot pulled pork. Maybe some of you found my blog that way. I love that this recipe made the top ten. It’s our favorite way to use the crockpot. Definitely be sure to put in the time to let the pork soak up the rub for a few days. You will not be disappointed with this recipe. 3. 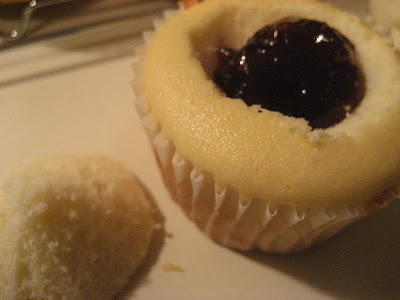 Fauxstess Cupcakes – posted April 9, 2009 – Fauxstess Cupcakes were all the rage a few months ago. They popped up in food blogs all over the place. It’s no wonder why. They’re awesome. 2. Alton Brown’s The Chewy – posted March 5, 2009 – Oh, the Chewy. How I love this cookie recipe. If you haven’t made it yet, please do. The first time I made these I fell in love with them. I like to mix up a batch and freeze the dough in portioned out cookie balls. 1. 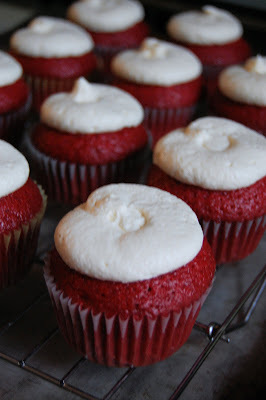 Red Velvet Cupcakes – posted Feb 19, 2009 – I’m so glad these cupcakes made the top ten as well. I had actually never tasted red velvet cake prior to making it earlier this year. It’s really great and very moist. And I came up with a great way to frost my cupcake that gives a good ratio without looking like a cupcake with tons of frosting on it. And that ends my week of recaps! Don’t forget to enter in my 2nd blogiversary giveaway by midnight on August 28th!